CBS Sports’ writer Chris Peters reports that details for the 2014 NHL Winter Classic have been released, and as expected, the Detroit Red Wings will host the Toronto Maple Leafs at Michigan Stadium on Jan. 1. The two franchises were supposed to meet in 2013, but the league lockout forced their meeting back one year. The game should set several NHL attendance records, as “the Big House” holds well over 100,000 spectators. 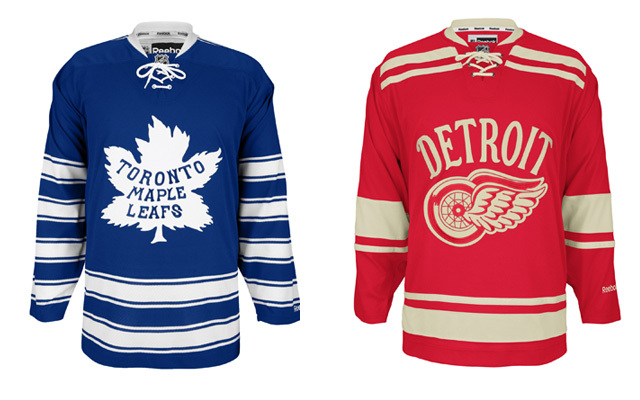 The league also revealed the jerseys that each team will wear, and both the Red Wings and Maple Leafs will be sporting fantastic looking sweaters for their New Year’s Day matchup. Coinciding with the Winter Classic will be the Hockeytown Winter Festival in downtown Detroit, which will feature various hockey games at Comerica Park. To get the full scoop, read the rest of Peters’ article. This entry was posted in hockey tickets, NHL tickets, Sports News, Winter Classic tickets and tagged 2014 Winter Classic, 2014 Winter Classic tickets, NHL Tickets by promc58blog. Bookmark the permalink.